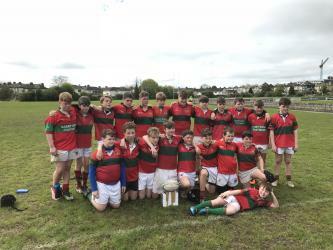 Last Saturday Clonakilty U13s took on Cobh in the final of Development league. In near perfect conditions Clonakilty took the game to Cobh from the kick off with the pack taking the ball up the middle at every opportunity. Sustained pressure eventually led to gaps in the Cobh defense which Paul Murphy capitalized on with when he barged over for the first try of the game. The conversion was missed but Clon had started well. Cobh however responded shortly afterwards with a try of their own when their center's broke through on half way and scored a try which they converted. It soon became apparent that Cobhs strengths were in their back line where they had two exceptional runners who were not to be caught once they got a yard away. Cobh dominated the score board for the rest of the half scoring 5 tries converting 4. The writing was on the wall for a Clon team who had competed very well in the set piece and in the ruck but was finding it very hard to get through the Cobh defence out wide and to defend their fast runners. In the second half Clon played the better rugby and kept the ball tight taking it up the center which was where they had the upper hand. Out half Ronan Hayes started to use the boot to get Clon close to the Cobh line. Paul Murphy again popped to score his second try from close in which was converted. Clon had their tails up now and went straight back at Cobh from the kick off. Sustained pressure resulted in a Clon scrum inside the Cobh 22. Set up to attack from the put in Clon were caught cold when the ball popped out of the scrum and Cobh intercepted and ran the length of the field to score their only score of the second half. It was heart break for Clon but they didn't show it, they immediately went back on the attack camping on the Cobh line until eventually they crossed the line through winger Taylor Murphy which was converted by Ronan Hayes. On their first half display Cobh deserved the victory but a very gallant Clonakilty side have much to be proud of for their never give up attitude. To be still playing rugby in the last weekend of the season is the ultimate as it means you are in a final. Clonakilty U13s in their first year playing youths rugby can be very satisfied with how far they have come. There is plenty to work on here with a full panel of 22 who all played their part in the season. Roll on September! Photo Caption: Back Left to Right Paul Murphy , Conor Hilliard , Killian Herilhy, Alan O'Driscoll Robbie Wilson Tom Ryan , Callum O'Sullivan, Elliot Ager, Ronan Hayes, Shea Murphy, Taylor Murphy Donnacha Walsh. Front Left to Right Jack McKennedy, Karl O'Regan, Obhran O'Connell , Patrick McCarthy (Capt) Alexi Binizar Obhran Mulcahy Finnan Neville . Front : Conor McCarthy ( Mascot & Waterboy) Missing : Oscar Kingston & Luke Noonan .